HANDMADE FROM SOFT & ATTRACTIVE FULL GRAIN LEATHER: Hide & Drink's Leather Cigar Case Holder is handcrafted by expert artisans from Pastores, Guatemala, to provide you with a sturdy and reliable home to your expensive cigars. Full Grain Leather is the best leather that you can get, and thanks to its supple, sturdy and attractive qualities it makes for an excellent Cigar Case. STYLISH, SLIM DESIGN FOR 50 RING CIGARS: This Full Grain Leather Cigar Case is made with strong, durable Full Grain Leather, and is stylish, soft and eye-catching in design. The case is designed to fit 3x 50 Ring Gauge cigars, and the case's slim characteristics mean that it's compact enough to easily store away in your bag or pocket, or at home or in your office desk drawer for work-related celebrations. MAINTAINS HUMIDITY AND TASTE: The natural insulation properties of the Full Grain Leather mean that this case helps protect the cigars from outside moisture and preventing them from drying out. With this case you'll be able to maintain the taste and richness of your favorite cigars. FINELY STITCHED AND DURABLE: Hide & Drink's Leather Cigar Case Holder is handmade with Full Grain Leather, the best grain of the hide. The use of this particular grain and its fine stitching will ensure that the Cigar Case will last you a lifetime of use. Once you've placed the cigars inside, the flap can be held down closed with the leather band for safety while you're on the go. 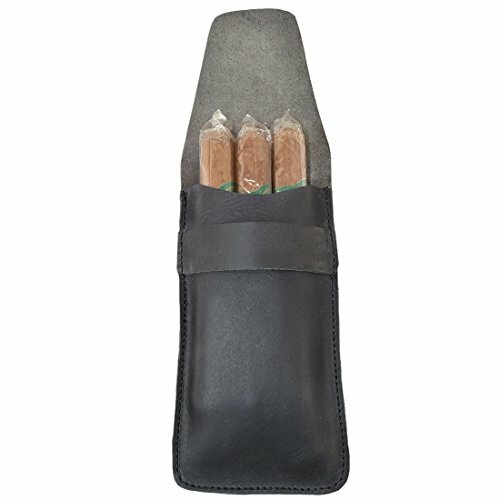 MAKES A GREAT GIFT: Hide & Drink swears by its leather, and knows that this fine, rustic Full Grain Cigar Case will make an excellent gift for friends, family and loved ones who enjoy the finer things in life. Handcrafted by expert artisans, this case makes for a stylish and functional gift for all cigar lovers.